As most of you know, I have been loving organic products. I have been constantly trying different organic skincare products from different online shops for two years now/ I regret to say that some organic products don't work on me, but majority works totally fine based on their claims. Everyday, I am too busy with work and mommy duties. Before midnight, I always feel muscle pains. Hubby will always give me a back rub just to make me feel little better. So I decided to look for an organic balm for my muscle pain which brought me to Naturale Bliss' IG. They offer few more products aside from the balm I was looking for. So, I decided to try other products they offer. I ended up buying 10g size of Naturale Bliss Balm for all Seasons, 2 spray bottles of Stop the Itch Inset Repellent Spray, Naturale Bliss Pain Pain Go Away, and 2 Naturale Bliss Healing Oils. When I experience headaches, I use a small amount of Naturale Bliss Healing Oil on my temples and my headache will gone. 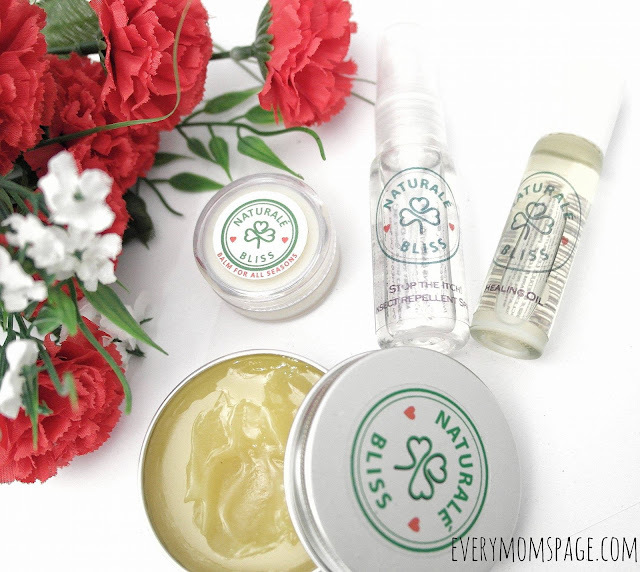 I always have my Naturale Bliss Stop the Itch Inset Repellent Spray handy wherever we go because it is effective in soothing itchy skin, especially insect bites. Naturale Bliss Balm for all Seasons is effective in treating minor burns. It soothes itchy skin as well. My Mother-in-Law has skin condition and her skin is dry and itchy. This balm helps soothe her skin, and lessens itchiness. This balm contains 6 different essential oils that can help relieve minor skin discomforts and eczema. Naturale Bliss Pain Pain Go Away helps me feel better whenever muscle pain attacks my back at night. At first, I was uncomfortable with the ginger scent but I get used to it later on. My husband gives me back massage and use this.It effectively reduces tension in the body. It has tingling effect at initial application then goes warm after few seconds. They have more products I wanna try, like the Mood Lifter Oil, New You Naturally, and the Hair Serum. If you are looking for effective yet affordable Organic Products, don't forget to check their Instagram Page.